A bottle of 26-year-old GlenDronach whisky signed by Donald Trump is expected to fetch between £2,500 and £3,500 at auction next week. The limited edition whisky was bottled in 2012 to mark the opening of Trump International Golf Links in Aberdeenshire, and is scheduled to go under the hammer at McTear’s Auctioneers in Glasgow on Friday, 13 January. Boasting the signature of the teetotal President-elect himself – whose inauguration will take place on 20 January – the GlenDronach whisky is one of 504 bottles released and comes with authenticated documents. It was distilled in 1985 and aged in a Sherry cask. Other notable whisky lots due to be auctioned at the sale include a cask of 43-year-old whisky from the closed North of Scotland distillery, which is forecast to sell for £50,000. In addition, a 52-year-old Macallan 1950 is expected to fetch more than £9,000. A Millennium Collection of Springbank, featuring full-size and miniature bottles of 25-, 30-, 35-, 40-, 45- and 50-year-old single malts, is forecast to sell for around £11,000. A bottle of Black Bowmore 1964 is expected to fetch between £5,500-6,500, while a £1,500 18-year-old Macallan is being sold in an effort to raise funds for the Earl Mountbatten Hospice in Newport on the Isle of Wight. 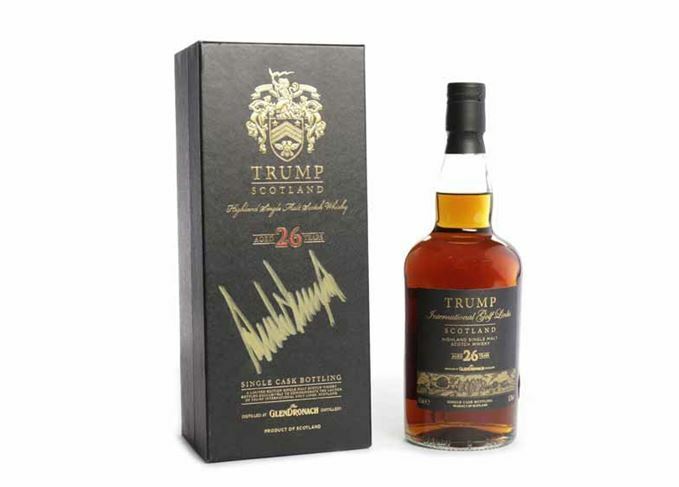 In December 2016, two separate bottles of the limited edition GlenDronach 26-year-old, also signed by Trump, were auctioned on Whisky.Auction. One bottle sold for £1,550 and while the other bottle received a bid of £1,800, it was not enough to reach the reserve price of £2,000. The 26-year-old GlenDronach signed by the President-elect doubled its pre-sale estimate. Luxurious bar is part of the US President’s controversial Aberdeenshire golf development. The seventh annual release has been matured in Pedro Ximénez and oloroso Sherry casks. Seven of GlenDronach’s 15 single cask releases for 2018 – all Sherry-matured bar one Port pipe.